A physics professor at Missouri University of Science and Technology will lead a four-year effort to spur research, development and commercial adoption of a new class of oxide semiconductors that outperform silicon-based transistors and could lead to new uses for flexible displays. 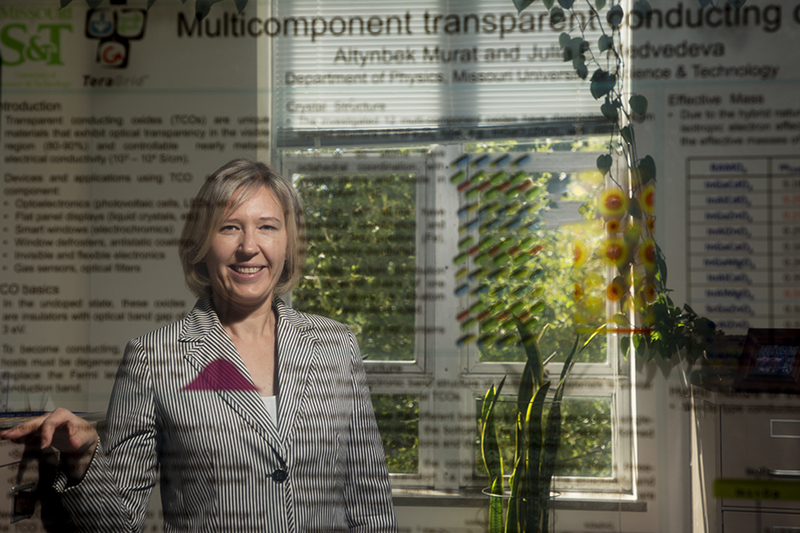 A team led by Dr. Julia E. Medvedeva, a professor of physics at Missouri S&T, was recently awarded a $1.6 million grant from the U.S. National Science Foundation to study the properties of amorphous oxide materials and to develop an open-access database for other researchers to use. The four-year grant is part of an NSF program called Designing Materials to Revolutionize and Engineer our Future (DMREF) and also involves researchers from Northwestern University. It takes effect Oct. 1. The oxide semiconductors Medvedeva will study demonstrate seemingly contradictory properties, such as optical transparency and electrical conductivity. These properties make the semiconductors ideal for use in flat-panel displays that consume less power while creating brighter images. Already in use in display panels made by Apple, Sharp, Dell, LG and Razer Inc., these oxide semiconductors also allow electrons to transmit much more rapidly than through silicon – as high as 50 times the electron mobility of “amorphous” silicon, Medvedeva says. That allows for higher pixel density, which in turn leads to better screen resolution. And because the amorphous form of these oxides can be grown at room temperature and on a variety of substrate materials, they can be produced at larger scales and at lower costs than silicon or other crystalline materials, Medvedeva says. “This is very fundamental research,” she adds, but notes that the results could enable advances in flexible-panel displays and wearable electronics, smart windows for homes and cars, and solar panels that could wrap around a surface to capture as much sunlight as possible. Crystalline structures such as silicon behave in predictable ways, she says. “Take a diamond, for instance, the hardest material on earth,” says Medvedeva. “The very reasons for the exceptional hardness of diamond – the high symmetry of the atomic arrangement and the strong interatomic bonds – are responsible for the gem’s major flaw. What physicists and materials scientists do know about amorphous materials is that “they have a smooth surface, with no grain,” Medvedeva says. “They’re also mechanically flexible,” which means they can be bent or twisted – imagine flexible solar cells that can wrap around a rooftop or even an entire building. They also can be “tuned” to either reflect, transmit or absorb light, properties that could lead to advances in smart windows, among other applications. In August, Medvedeva and Northwestern University researchers Dr. Bruce Buchholz and Dr. Robert P.H. Chang published a paper on the topic in the journal Advanced Electronic Materials. Thank you very much for your message and interest in my research. I am very sorry to hear about your son. My project does not have direct relevance to imaging and medical applications. Alexey Yamilov, who is also a faculty in Physics at Missouri S&T, is currently working in this specific area. 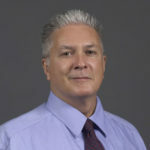 He studies light propagation with a goal of developing novel imaging techniques in strongly scattering media such as biological tissue. I am sure he will be glad to tell you more about his research.